This bumble bee was one of at least fifty or so small bumble bees covering a purple aster (a bush about four feet tall all round, one itself of four or five others with similarly large clouds of these same small bumble bees). This particular bumble bee had—like countless others—perhaps purposefully overstayed its time past sunset on this late September afternoon, and was now incapable of flight, bumbling like so many others from flower to flower in search of a good place to spend the night (to awake to nectar first thing next morning). In the middle of some particularly arduous bumbling this bee fell, plummeting through the air with legs outstretched… and as it happened, caught hold of a thin blade of vegetation. Upon the end of which this poor little bee now struggled piteously before my gaze, only energy enough barely to try to hold on, and nowhere else to fall but the ground. 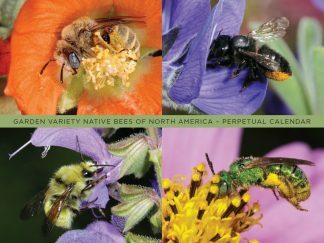 I thought I’d add to this post now I’ve learned more about bees. Late summer is a time when you’ll find male bees sleeping in flowers overnight. They often sleep (or “roost”) in groups on the flowers. 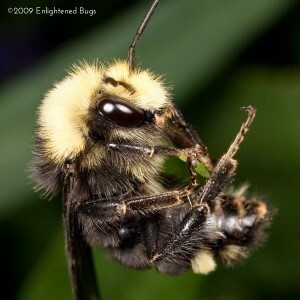 The bee in this story was one such male bumble bee. In the morning, he and his friends would have had a nice start, warming up in the sun and sipping on nectar… in the perfect spot to find female bees visiting flowers that day!